STEAGALL, Henry Bascom, a Representative from Alabama; born in Clopton, Dale County, Ala., May 19, 1873; attended the common schools and the Southeast Alabama Agricultural School at Abbeville; was graduated from the law department of the University of Alabama at Tuscaloosa in 1893; was admitted to the bar the same year and commenced practice in Ozark, Ala.; county solicitor of Dale County 1902-1908; member of the State house of representatives in 1906 and 1907; member of the State Democratic executive committee 1906-1910; prosecuting attorney of the third judicial circuit 1907-1914; delegate to the Democratic National Convention in 1912; elected as a Democrat to the Sixty-fourth and to the fourteen succeeding Congresses and served from March 4, 1915, until his death in Washington, D.C., November 22, 1943; chairman, Committee on Banking and Currency (Seventy-second through Seventy-eighth Congresses); co-sponsor of the Glass-Steagall Act of 1932; interment in the City Cemetery, Ozark, Ala.
Papers: 1930-1943. ca. 4 inches. Chiefly material on state banks. Also speeches, material on coffee industry, and vice presidential nomination of William Bankhead at 1940 Democratic Convention. Papers: In the Alabama Governor (1943-1947: Sparks) public relation files, 1943-1947, 9 cubic feet. Persons represented include Henry Bascom Steagall. Papers: In the William Brockman Bankhead papers, ca. 1872-1952, 41 cubic feet. Persons represented include Henry Bascom Steagall. Papers: 1913-1993, 6 cubic feet. 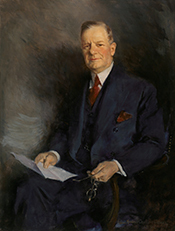 The papers of Henry Bascom Steagall include correspondence (1917-1942) concerning legislation, including banking and currency, military, and New Deal legislation; constituent requests and correspondence (1921-1943); patronage requests (1933-1940); newspaper clippings; taped speeches; correspondence (1925-1987) of Steagall's daughter, Myra Steagall Law; and genealogy records. Key, Jack Brien. " Henry B. Steagall: The Conservative as a Reformer." Alabama Review 17 (July 1964): 198-209. United States. 78th Cong., 2d sess., 1944. House. Memorial services held in the House of Representatives of the United States, together with remarks presented in eulogy of Henry Bascom Steagall, late a Representative from Alabama. Seventy-eighth Congress, second session. Washington: Government Printing Office, 1946.